Siempre Madrid: Debate: Ronaldo, Kaka or Ribery? We're exactly half-way through the season. And 19 games on, it is clear even to a blind man who's going to win the Liga this season, barring the Catalans push the infamous self-destruct button (fingers crossed!). While Barcelona have been demolishing everyone in sight, Real Madrid have been scrappy and peeled off results in recent weeks. And though the hard-fought recent results are heartening, the quality of our game continues to be poor. Don't get me wrong, I'm not demanding aesthetically pleasing football immediately from a manager roped in mid-season. But let's face it, since the departure of Zidane, Figo, Ronaldo and co, i.e., the wicked Galacticos, our play has never quite been eye-candy. Slick movements and passing are a rarity, one touch moves are non-existent and outrageous goals are scored not more than twice a season. The obvious question thus arises. Should we resort back to a few new Galacticos? The answer, I'm afraid, is yes. The first three and a half years of the Galacticos era were not only successful but very pleasing to the eye as well and a revisit to those years can only bring contented smiles on the faces of most Madridistas. And even though in the latter years it went on to become hugely disastrous, the style of play never quite reached the nadir of our game today. I think the solution is a trade-off. The right mix of superstars and youth, of proven talent and potential kids, of stylish wizards and hard-workers. And I think we've learnt from past mistakes of not flooding the team with superstars and their egos at the risk of losing genuine talent and players with a sincere work ethic. As of now, one look at our squad is enough to know that not only is it a decent one, but also a big one. But the point is we desperately need quality here, and not quantity. We need just ONE player, and not a host of them. Our embattled Sporting Director, Pedja Mijatovic made a rare sensible statement during last summer's transfer window when he said, "At the moment, one great player is much better for us than three good ones". We need just that one magical player who can turn things around single-handedly when they aren't going well. As of now, I can't think of any single player in our squad who can do that, who has that magic. Admittedly, Robben does. He's started doing that the past few weeks. But who knows where the next injury is lurking? There's no doubt we need one of those "wizard" signings; someone who can actually scare defenders the night before the match itself. It's high time we got someone like that once again at the Bernabeu. So who should that ONE great signing be? I can only think of two genuine current greats who Real actually have a chance and a possibility to sign and yes, they are Cristiano Ronaldo and Kaka (Messi is out of question for obvious reasons). Now Ronaldo definitely makes more sense, seeing as our squad has only one proper winger, and that too an injury-prone one. 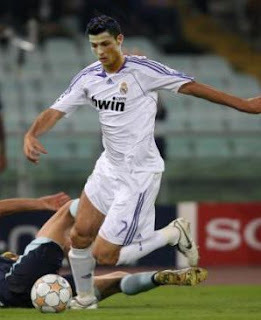 Sure, Ronaldo is not all that blessed in the grey area and his ego seems to inflate with every goal he scores. But that can easily be overlooked and his talent definitely overshadows the tantrums. Not only does Ronaldo offer wing-play and good crosses but he also comes up with a chunkful of goals (though I still believe his last season's tally was a one-off). He'd offer that flair and the bag of tricks that's missing right now. He's still relatively young. I believe he can still improve further. And plus he's two-footed. Though it might seem a minor point, it's essential for every great winger to have two feet, and most whos-who of football have always maintained this. Cristiano Ronaldo would be a near perfect signing. However I'm not that optimistic of seeing Ronaldo donning the famed white, at least not as long as Fergusson is around. Even if we have the man with the magic wand around (as far as getting big name players go), a certain Senor F.Perez, I'm not too sure of us landing Ronaldo. In spite of all the recent talk of him changing his brand to CR9 and all that, I remain doubtful. So, we're back to square one, with no one capable of turning on the style consistently. So only then, should we go for Kaka. A lot of fans are apprehensive about signing him, and rightfully so. Our central midfiled, at the moment, is cluttered with too many hopefuls. The players in queue for the central midfield position are Diarra, Diarra, Gago, Sneijder, Van Der Vaart, Guti, Parejo and De La Red. Now let's look at this rationally. Both the Diarras and Gago are vying for the defensive midfield position and I agree three players for just one position is a lot, but none of them plays the role we can expect Kaka to perform. Van Der Vaart has simply failed to impress this season and many have expressed doubts that he can turn it around. Most Madridistas would be glad if he did, but I just don't see that happening. Guti is way too inconsistent and depending on him to do that prime role of playmaking, every week on a consistent basis is just impossible. It's an uncomfortable thought having him as our main source of moves for an important Champions League 2nd leg game, for example. He doesn't turn up the heat in most big games. But he'd be very effective coming fresh off the bench in say the 60th minute. 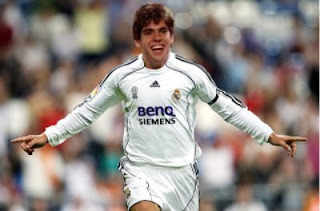 As for De La Red, neither does he play in Kaka's position, nor does he possess Kaka's talents. We're not even sure he'll ever play again, sadly. Parejo is still young and he'll learn gradually. In fact, he'd tremendously benefit from having Kaka around. The way I see it, Kaka could potentially fit in easily. Selling Van Der Vaart and pushing Guti to the bench should make way for him. The midfield could be (L/M)Diarra, Sneijder, Kaka, Robben. Add Guti, Gago and Parejo on the bench and that does look really good. Hell, it might even look like the stuff of dreams. People might argue that signing Ribery makes more sense, given that a winger is the need of the hour. But if I had to choose between Kaka and Ribery, I'd still go with the Brazilian. It's just very hard to turn down a player with the ridiculously abundant talent and complete passing range and consistency that Kaka possesses. Ribery, for all the talent that he has, is still no Kaka. I don't believe he's the "main star" that we're looking for here. Excellent read, and I agree with the author. Kaka' is the best option seeing Ronaldo is next to impossible and the Brazilian is a player who you can build a team around, so there is no question of fitting him in, he has to fit in. He's only 26 and has good 65-6 years left in him, and there are very few players in the world currently who can be so effective on the counter attack as well. He helps Milan to switch from defense to attack in a heart beat with his pace and dribbling which played a major role in their 2007 UCL victory. I kinda disagree with the article favouring Kaka over Ronaldo. Jusicfications are very much biased towards Guti, For me an Inconsistent Playmaker is not the one who can hold the most Liga assist record and who can tear apart any defence who try come High Line, actually thats what Kaka does so but what makes him better than Guti is his number of goals than assists and we already have Sneijder and Van der Vaart in that department of Attacking. Unfortunaltely we are so impatient to wait for Real talent to shine. A Glimpse of Class has already been shown by both Dutchmen but yet it amazes me that we need to seek that "Game Changer" in that department. As far as Parejo and DLR are concerned, they both are young and have talent to prove themselves and yet they are very much different from Kaka and other 3 team-mates. We are not Lacking Game Changer Department of CM but of Wing position and to play whole season with one Injury prone Winger is "Too satisfactory for Author" but not me. We had been struggling last season in europe and this season against Organised defences is not due to that CM role but due to our lack of Stretch play for which we were famous in late 90s n early 2000s. We need to get back to our basics of "Stretch the play to Flanks and Kill te game from Middle" strategy and for that we need a Game Changer Winger and Currently thats Cristiano Ronaldo. A player who can offer to the position we need and a player who can help us get our attacking class in Europe back against tight defences by splitting them from middle for playmakers like Guti and a player who himself have the ability to run down defences all alone. Cristiano is that player. Point here we are talking is not transfer of a player(who wants himself at Bernabeu) but desperation of OUR need for him to make us complete. Cristiano for me is no impossible considering the fact, we are famous for our Galacticos transfers for record fees and Electorial Campaign coming summer will fuel it to more reality than Rumours. Frank Ribery is no doubt a better player but surely not the game changer. he is good player if played in right position!! Id go with Cristiano. He`s the youngest and has the brightest future of the 3 players mentioned. He has an enormous pull in terms of merchandising similar to Beckhams so we would make money back making his transfer fee not as exaggerated as people may think. Also he is versatile and can play on either wing which is what we need. He scores much more goals that the other 2 players mentioned and is much much quicker. As for the creative side, why would we buy Kaka if we have Sneijder ? I think it would be a waste.